A tiny new frog species discovered in tropical forests of southwest India has been one of a kind for millions of years. Palaniswamy Vijayakumar and his colleagues first spotted the new species one night in 2010 while surveying frogs and reptiles roughly 1,300 meters up in India’s Western Ghats mountain range. The frog hardly stood out — its brown back, orange belly and starlike spots acted as camouflage against the dark hues and water droplets on the forest floor. And at only 2 to 2.9 centimeters long, “it can sit on your thumb,” says Vijayakumar, a biogeographer at George Washington University in Washington, D.C. 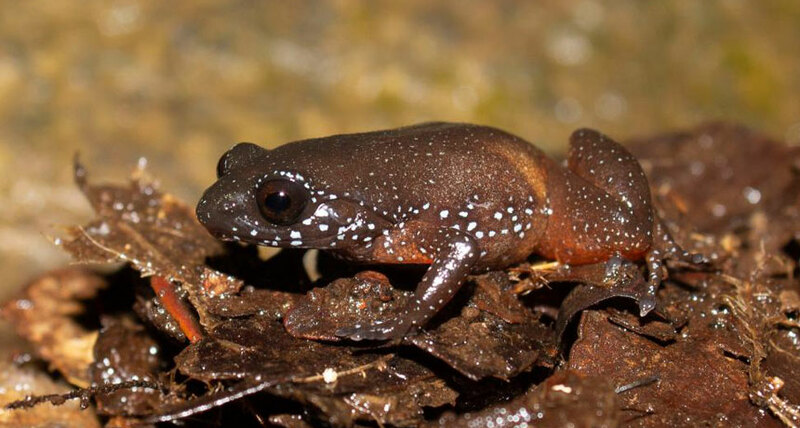 Dubbed the starry dwarf frog by the team, the frog didn’t seem special among the dozens of other possibly new species discovered on the trip. But analysis of its DNA, anatomy and geographic distribution told a different story. The frog represents the sole known species of a lineage dating back 57 million to 76 million years ago, the researchers report March 12 in PeerJ. That’s around when the Indian subcontinent was merging with Asia after breaking away from Madagascar. “I had no clue I was holding onto a 50-million-year-old lineage,” Vijayakumar says. The researchers say the frog represents not just a new species and genus, but possibly even a new family, which they are working to confirm through genetic analysis and anatomical comparisons. “It’s a unique, old lineage without any close relatives” known to science, he says.